Brands are funny. You find one you like and then they use it to sell you something new. I was never that into Pepsi (shocker) until Pepsi Max - and then it was a bizarre set of circumstances where I ended up buying a coat because I really liked it, but that oddly had the Pepsi max logo on the sleeve. Now as an old person I prefer Pepsi to Coke (and Fentimans to either frankly) and so finding new versions is fun. I almost didn't buy this because it was a whole 35p more than the regular Pepsi - but I can't review that again so here we are. I'm really not sure why Walsall UK had a bottle of Indonesian (it appeared) Pepsi, but it looked exciting and exotic. And it is very blue - unlike the Elderflower Fanta (that I mistakenly thought was nice grapefruit) it's not just the bottle - it's actually Blue. In fact - visiting my Granddad it looked like I'd got some odd kind of medical sample. Not ideal. And frankly - its got a berry flavour, and a cool colour, but it's not actually that interesting. And it's certainly not Pepsi. I mean - I'd happily drink it again, it needed to be colder and drunk more like a slush puppy on a hot day, but it's not a blue cola like I expected. Tab Clear was a clear cola at least. So this is more expensive than Pepsi, but tastes like cheap pop (Mick Foley special) so unless you have an instagram account (or someone to freak out with a blue drink)then it's probably not worth it. Now I love a pack of Walkers crisps, I must admit. It's certainly rare I haven't liked a flavour. We always have an array of crisps in the house, but Walkers crisps are a keen favourite amongst them. However, it's rare I don't enjoy any bag of crisps from most manufacturers! I've had Sriracha flavoured snacks before. 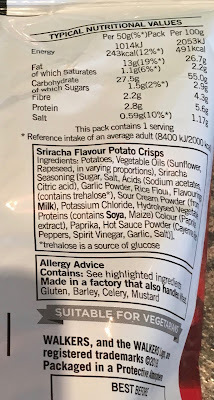 For those that don't know… like me, as I've just looked it up… Sriracha is a type of hot sauce made from a paste of chilli peppers, distilled vinegar, garlic, sugar and salt. 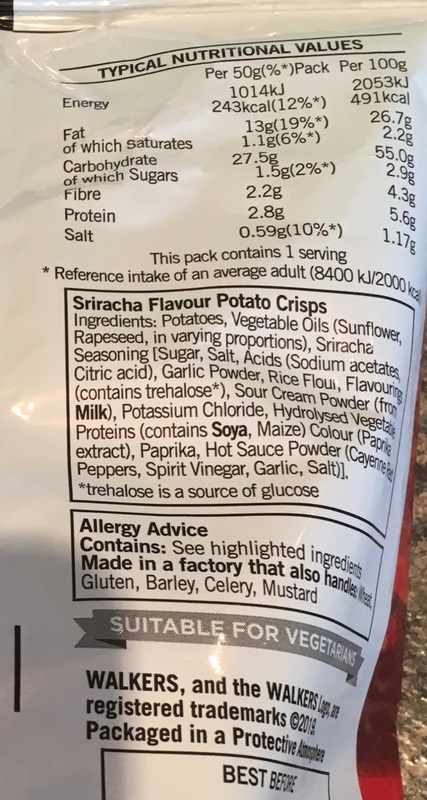 As mentioned I have tasted Sriracha flavoured snacks, but not the sauce. As far as I remember it's got a kind of spicy chilli garlic kick to it. On opening the Grab Bag packet the crisps inside were very reddish in colour. I instantly figured these would be hot. On taste they predominately taste of chilli, then strong garlic with a sweetness from the sugar. These crisps have a chilli burn that built the more I ate of them. It's really difficult to stop eating them while I type. They taste rich in flavour, rich in chilli heat, and rich in garlic, so don't expect many kisses unless you share them. I'm too greedy of course. I kept the bag to myself and scoffed the lot! The 50g bag contains 243 calories, with 13g of fat, 1.5g of sugar, and 0.59g of salt. Please see photograph for ingredients. 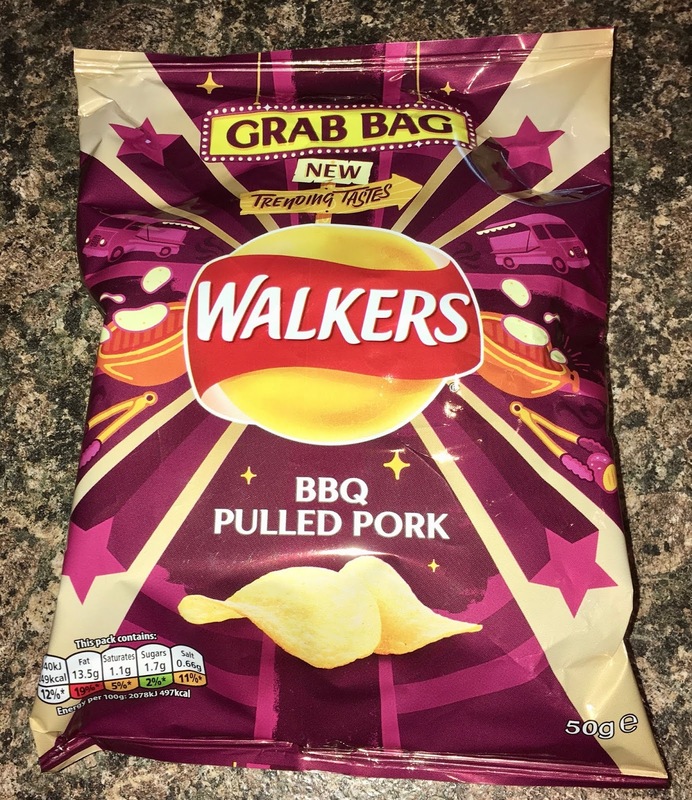 These new crisps are in the new Trending Tastes range from Walkers crisps. There are two new flavours but Spectre nicked the other bag so you will have to wait till they appear at the top of review pile for him, possibly on Wednesday. These ones are BBQ Pulled Pork and immediately felt familiar. It must have been a long “trending taste” as these were launched as a Walkers Max ridged flavour back in February 2017. This version is in the bigger grab bag format, but are regular Walkers crisps in terms of texture, no ridges here. I poured out the hefty portion of Walkers BBQ Pulled Pork crisps on to my plate and was impressed with the amount and could see a slight orange tinge to the seasoning. The flavour was pretty decent, there was spice, there was barbecue sauce flavour and there was a nice meatiness too from the pork. I liked the added smoky taste, it helped with the barbecue flavour. They were a little sweet from the sauce though, and I felt myself wanting something a touch more savoury. I think it might be a sweet tomato base, but I couldn’t help thinking a sprinkle more of salt and a little less sugar would have given them some balance, particularly when you are having them with a savoury sandwich. 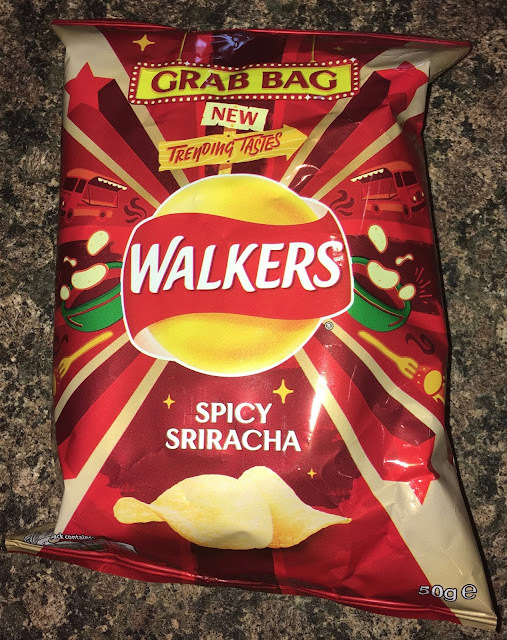 Don’t get me wrong they were still tasty, but I’m more intrigued to try the other new flavour Walker Spicy Sriracha crisps which Spectre has put somewhere out of my way, that really is a Trending Taste. Interesting things have been happening today. Firstly I had a bit of play to update the header of Foodstuff Finds, see above. Hope you like it? I normally have minimal artistic talent so I was quite pleased with the results. We then decided to have pizza to celebrate. 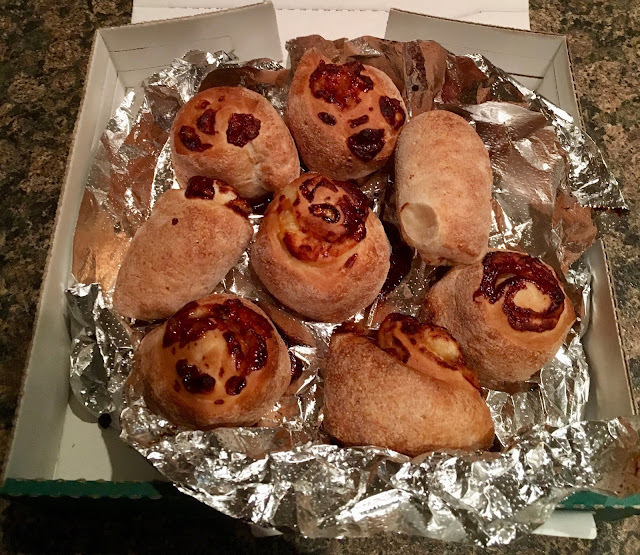 We ordered via Papa Johns so obviously I had a look at the new items available on their website and found these Marmite and Cheese Scrolls so added them to the order. Then I was doing that thing where I stare out of the window waiting for the delivery man, a car went passed and Spectre asked if it was the pizza, I called back “No, it is a Frogeye Sprite, and nobody delivers pizza in one of them.” My mistake, it pulled up outside our house and out got our Papa Johns delivery man. I think the first thing we noticed was the strength of the aroma from the Marmite before we even opened the box. 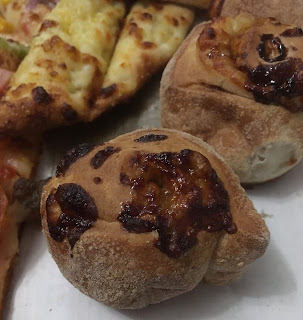 Inside were quite a few Marmite and Cheese Scrolls, and I put a couple on the side of my pizza. I gave one a try and although I am a Marmite fan I still found the flavour a bit strong. I liked the soft doughy texture, and the hint of cheese. The salty yeasty taste lingered on the palette too long and distracted from delicate tastes on the Garden Party (veggie) pizza. I ate all my Marmite and Cheese Scrolls though, I was just left with the thought that I wouldn’t miss them if they left the menu. Spectre wasn’t impressed at all, he said they were too strong for him, he can tolerate Marmite crisps, but these were not his thing. He then munched the decorative chillis from the side of the pizza as he often does, the first one was the usual heat he said. The second one he ate whole, and it blew his head off. Sweat was pouring off him, I gave a supportive laugh and then realised he was genuinely struggling and got him a large glass of milk to drink. Turns out the Marmite and Cheese Scrolls weren’t the worst tasting thing on his plate after all. As part of my Valentines Day care parcel I got these new, thin biscuits. After our appearance on the BBC reviewing these sorts of things last year it's become a running joke. Which is good because it means I get lots of biscuits - hooray! These are your standard style - a little over-packaged and probably more expensive than the standard ones. What is actually going on here though. ...but not from the side. These are essentially a thin bourbon biscuit, which is already fairly thin. The main difference (as with most of the thins) is that these are actually a little crunchier than a regular bourbon - and because they are digestive the texture is more fun too. The creme in the centre is really firm too. These really are their own kind of biscuit then - with the similarities to bourbons being purely cosmetic. They aren't even like the Oreo double choc thins. These are great and while not quite as compulsive as the last biscuits we talked about they are worth picking up. I tended to only eat one or maybe two of these per visit to the pack, so they may actually be an effective biscuit intake management strategy. If you ignore the thin branding and think of these as crunchy chocolate digestive sandwiches then you'll probably have a better idea of what you'll get. I haven't watched a Carry On film in years! I have certainly watched most of them, if not all and several times over. I grew up on that bawdy sense of humour and will always give a snigger to the great British innuendo. I can't help it… so when I last went to uni and found myself the oldest student by far, I was taken aback by how many younger students didn't get the double entendre. Many hadn't even heard of Carry On, which made me feel even older! So when someone says "peach" to me it doesn't necessarily mean fruit, or at least the type that grows on trees. In my experience neither go well with beer though, however don't let it be said that I don't have an open mind… snigger! This is a beer that takes itself seriously though, you can tell by the label. The label is plastic free and the Jubel brewery, in Cornwall, is committed to low carbon emissions. This beer is gluten free and Vegan friendly. Not that I know many Vegans or any unfriendly ones! It's infused with natural peach, which is where it loses me a little. I do like peach, I rarely eat one… in fact I think our hedgehog had the last one that graced the fruit bowl in the kitchen. I do like peach yoghurt though, so that's a plus. "I thought I caught a hint of malt there for a second, in the initial flavour?" 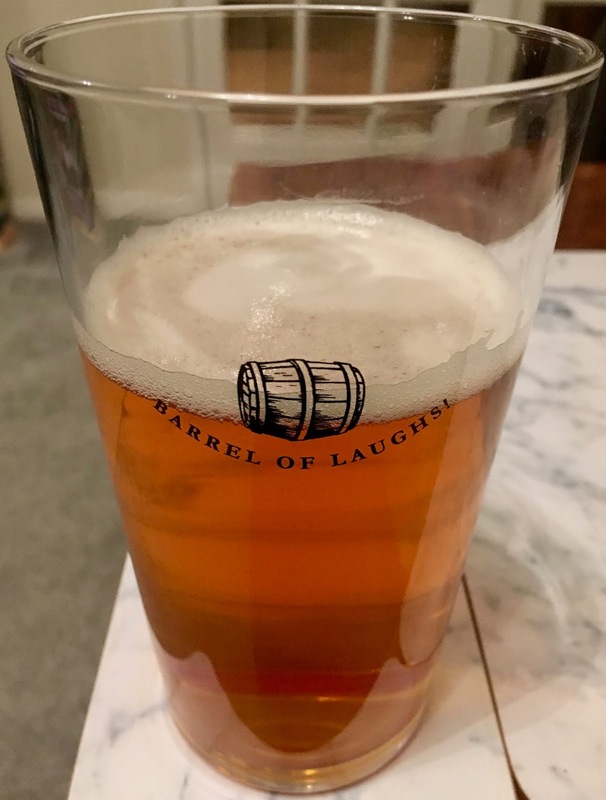 I may say, "and there was that minute bitter herbal hoppiness towards the back of the flavour?" "No, no… it's a peach cider!" said the trickster. "Not really any cider apple there at all?" I'd mumble. "They forget the cider apples!" 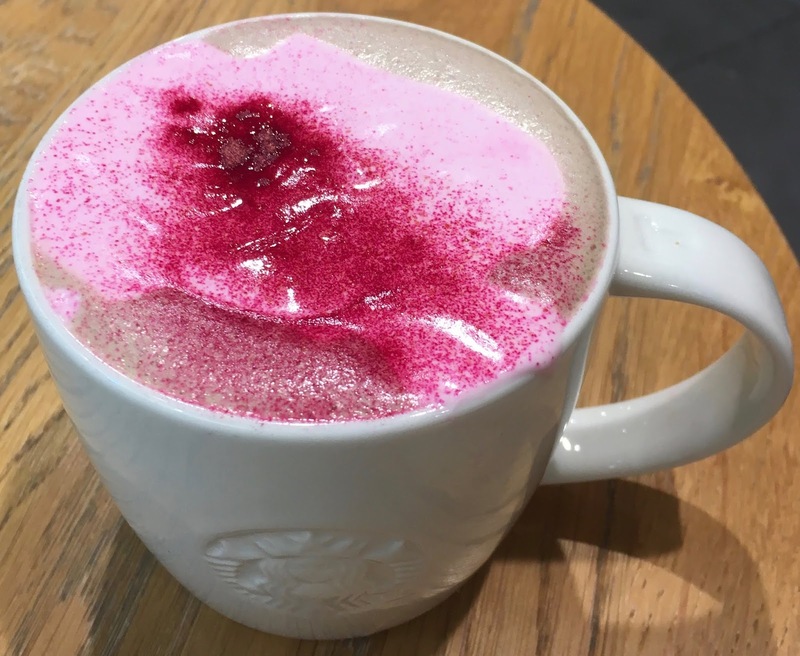 "Bizarre… Well, it was pretty fizzy! 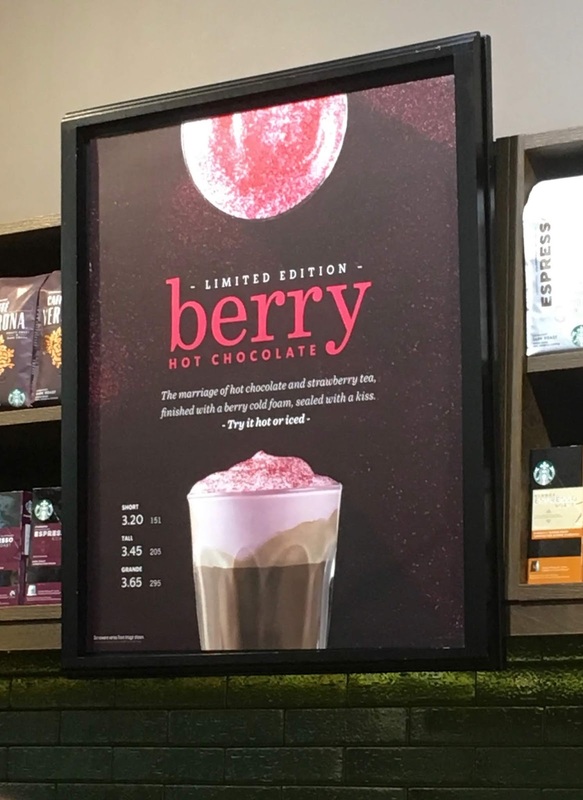 And it's definitely a peach of a drink!" I was looking for a quick dessert, something which is a treat but which isn’t too big to eat. 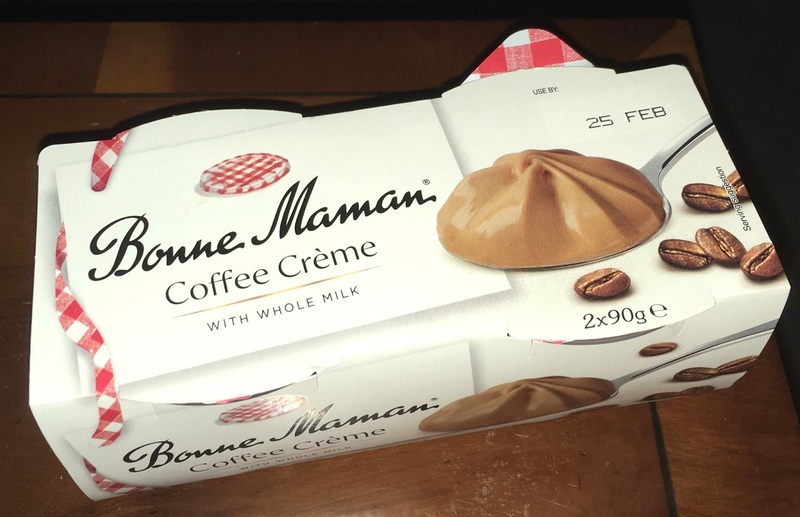 I spotted these desserts from Bonne Maman and couldn’t resist picking up the Coffee Creme variety. There are two smallish pots in the pack and I thought I’d try them out after dinner. The pots are fairly small, but are neatly packaged with a pleasant chequered foil lid, reminiscent in design of the covers you used to get on hand made jams. 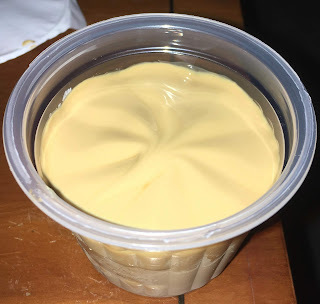 The Bonne Maman Coffee Creme Dessert is beige in colour and surprisingly glossy to look at. I gave one a taste test and realised that I had assumed it would be a mousse in texture, but that it was actually quite wet and more like a thickened sauce. The texture wasn’t too bad when I got used to it, I had just been expecting something more fluffy. The flavour too was strong in coffee, but not quite as sweet as I had hoped. Don’t get me wrong I drink espressos straight with no sugar added, but this is a dessert and my sweet tooth was craving a sugar hit. I don’t think the Bonne Maman Coffee Creme Dessert was bad, it just hadn’t been what I was expecting. The coffee taste was rich though, and there was a nice creaminess to the flavour. I’m still intrigued enough to want to buy the dark chocolate version. Sometimes the biscuits that get brought into work are a little more exciting than others. Take these Nairn's Dark Chocolate Chip Oat Biscuits for example. Made by the purveyors of luxury Scottish Oat Cakes, but with a little more sugar and chocolate than normal, these seem to be marketed at the healthy snack end of the biscuit aisle. And even though I mistakenly cut off some of the nutritional values off the picture you can see that there is a bit less of the bad things and a bit more of the good things than average. Plus the individual biscuits are very thin and portion control would probably be quite easy. In the interests of science I ate 5. They are sweet like biscuits but have the consistancy of a Hob Nob or more oaty biscuit than the very processed ones that appear in normal tins. For me this is quite a welcome variation. I love the mixed up texture, and would be happy to eat fatter, rougher versions of this rather than have the 5 thin ones in a sealed pack. 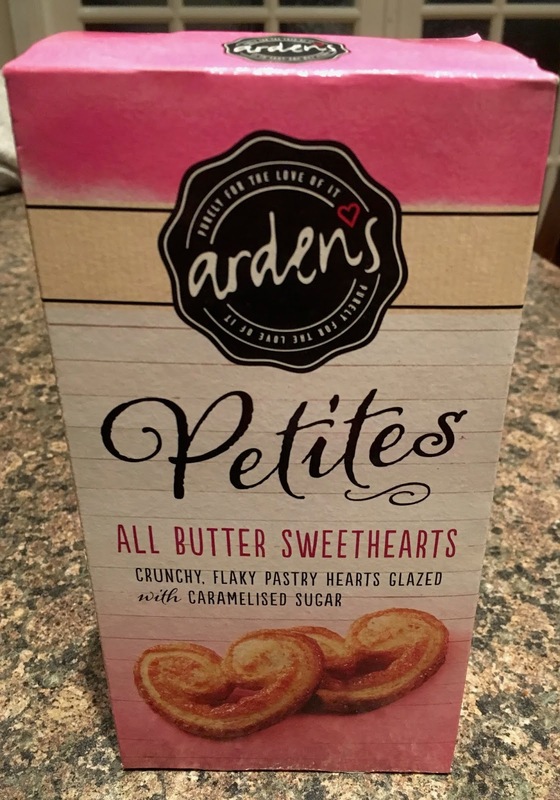 Overall though a win, and if you are looking to add a little nutrition to your biscuit, and lose a little sugar then frankly these are a great idea. But you'll probably end up eating all 5 too. 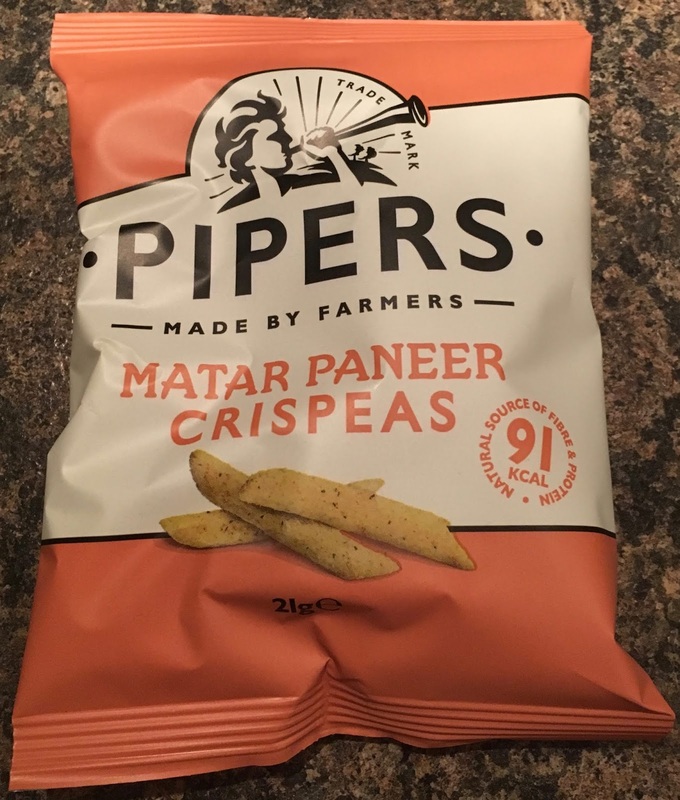 I'm always on the lookout for alternative snacks to flavoured nuts, and these Pipers Matar Paneer Crispeas are made from marrowfat peas. They have a green colour to them in the image on the front of the packet. This sort of snack always reminds me of mashed and chopped up cooked Gremlin! Matar Paneer Crispeas are seasoned based on a traditional North Indian recipe. I'm not going to pretend I know what it tastes like, because I'm fairly predictable and usually go for a Lamb Balti at the local curry house. From the ingredients it seems to have mostly every herb and spice I could just about think of if they whizzed passed me on a Generation Game conveyor belt, and these Matar Paneer Crispeas also have a touch of heat from Cayenne Chilli. On opening the packet considering the Cayenne Chilli seemed to be almost an afterthought towards the end of the ingredients list, there was quite a thwack of it in the aroma of the multitude of greenish sticks. This was quite bizarre as there was barely any chilli flavour on eating, except a very mild chilli heat. I could also pick up on cinnamon, cumin and parsley in the smell, and also a touch of onion. The sticks were nice and crunchy, and there was plenty of mild curry flavours in these Matar Paneer Crispeas, which made them quite moreish. However, I did get the feeling that these are pretty heavy on the garlic and onion, so not good for kissing without a breath mint or two! 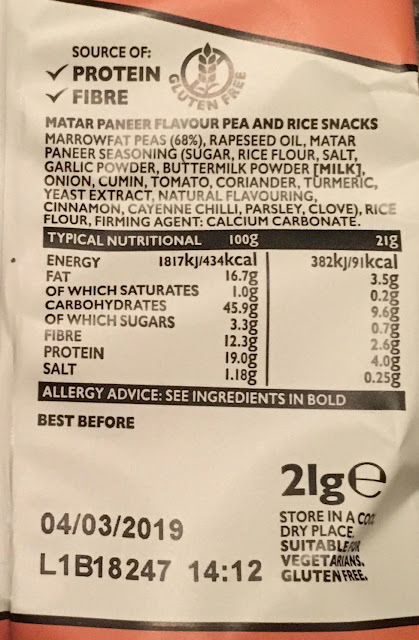 The 21g packet contains 91 calories, with 3.5g of fat, 0.7g of sugar, and 0.25g of salt. Please see photograph for ingredients. 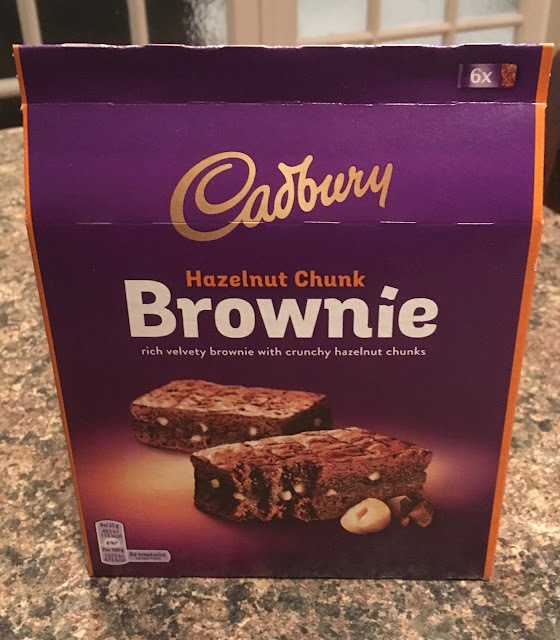 I found these Hazelnut Chunk Brownies from Cadbury listed under New Products on the Asda website, but when they arrived from my online order I realised they didn’t actually have a “New” label on them. I haven’t seen them before though, and I do keep an eye on these aisles in the supermarket obviously. I found the packaging to be a little bit basic. Part of me thought when they arrived that these cakes were in fact a bake your own type kit, as they were just is a flattish cardboard box. This wasn’t the case, inside were 6 small individually wrapped Hazelnut Brownies. I unwrapped one and saw that there were quite a few nuts baked in and that they looked quite thick and soft. The texture is good, they manage to keep that heavy moist feel, while still remaining actually quite light. Clever. 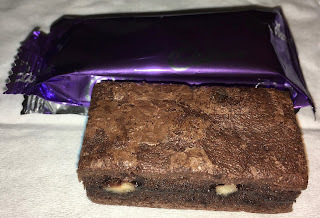 I think this is the perfect Brownie texture, and that combined with a vey rich chocolatey taste and plenty of cocoa, I found myself loving every bite. The hazelnuts add lovely wholesome texture and I ended up reaching for a second Cadbury Brownie. The packaging might be a bit basic, but the quality of the Cadbury Hazelnut Chunk Brownie was spot on, and I think that is all that matters. Time to order a box of the plain brownie version of these without the hazelnuts, for research purposes of course. 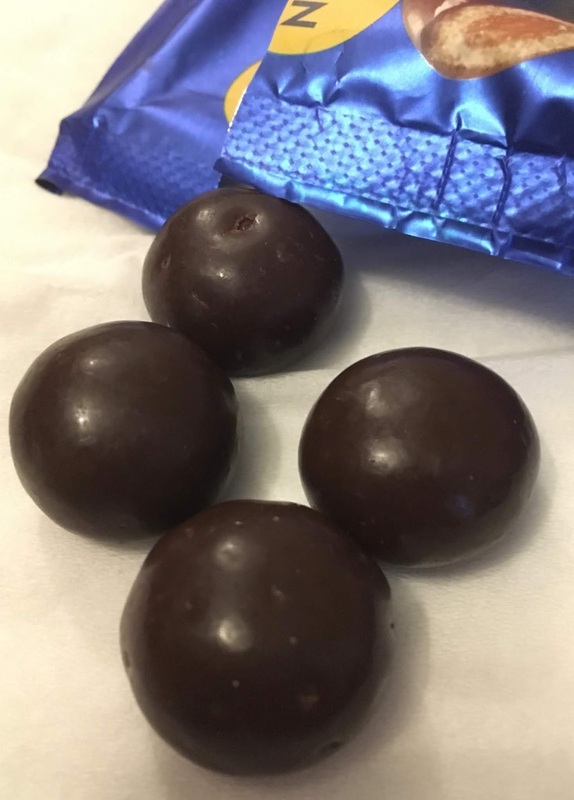 There is a product that comes and goes in the UK called Kit Kat Pop Choc, essentially they are squares of Kit Kat completely coated in milk chocolate and sold in grab bags. I’ve seen them come and go several times over the years, with even a yoghurt version at one stage. I haven’t seen them for a while but as a fan of wafer these new Marks and Spencer Belgian Milk Chocolate Wafer Bites looked like they would be worth a try in their place. As these are an M&S product the coating over the square of wafer is Belgian milk chocolate, to make them posh of course. There were quite a few in the bag and I gave one of the cubes of chocolate wafer bites a try. The first thing to note is that there is a lovely thick coating of sweet milk chocolate that was very lush. It is a rich thick melt chocolate and when you then hit the crispy wafer the texture is pleasant and thy are enjoyable to eat. These are nice chocolates to share, especially while watching a film, between the good quality chocolate coating and the texture they are fun and easy to eat. 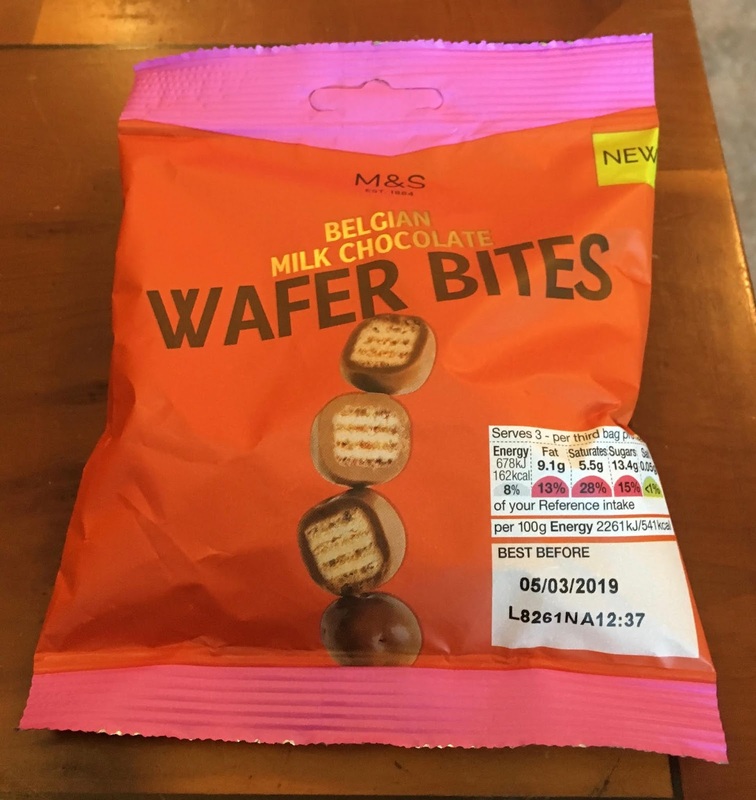 If you are a fan of Europe’s Kit Kat Pop Chocs and you can’t get them at the minute these new Marks and Spencer Belgian Milk Chocolate Wafer Bites look like something that will happily fill the gap until their next launch. Buy a couple of bags though, our didn’t last very long! A friend of mine shops in Marks & Spencer’s and alerts me to (and buys for me) their wonderful lunch offerings. As I’ve mentioned before - if our hospital ever gets one then I will be bankrupt. A sushi sandwich it turns out it two slices of bread (rice) with a filling of luxury goodness (here Bacon chicken and avocado) wrapped in some seaweed so you can hold it. There is also a sachet of yuzu and chilli dressing. Look at all those ingredients! And look at the yumminess of it all. 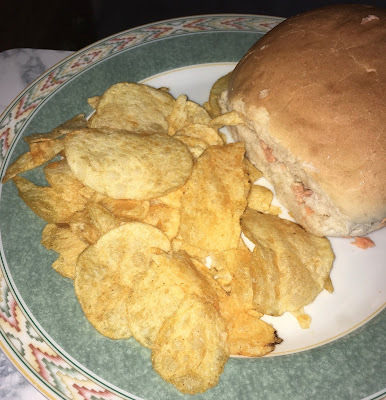 It’s really fiddly to eat - like a roll you have to have a bite at a time. All of the bites are good though and one set of two was filling enough for a normal size lunch. I did eat some biscuits in the afternoon though. I’d have these again, once a week I think if I could! I had one of those memory lapse moments yesterday. The one's where you're talking to someone about something and you just can't remember a word or name and it drives you crazy. I just knew I'd remember it after the conversation. I was at the gym being a bore as usual about the rehabilitation of my knee after surgery once I'd popped to the shops wearing my old (really, really old) cowboy boots. In the past I've amused Cinabar by walking like the mad robot cowboy in the '70's film Westworld. It's not like a John Travolta strut, it's something far more sinister. Westworld is a great Sci-fi yarn (not for everyone I suppose) about a futuristic holiday resort where the cybernetic robots end up going mad and trying to kill the guests. I just couldn't remember Yul Brynner's name until afterwards. It's all part of being off work for a long period of time and not keeping my brain in gear. Anyway, after parking my car at the shops I had managed scary Yul's walk for about three minutes before it hurt too much, which is pretty good considering up until now all I've managed is a dodgy limp. I'm away with the fairies much of the time, daydreaming about everything and anything. 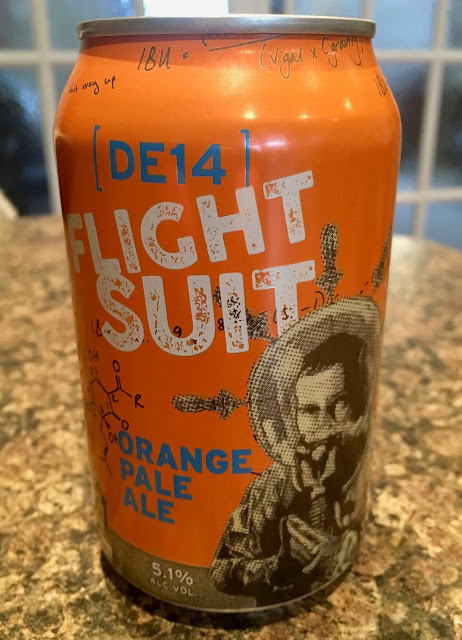 So that's what this beer is about I guess… Flight Suit is an Orange Pale Ale from the DE14 Brewery in Burton-Upon-Trent. So bring out your fishy and or spicy meals to enjoy with this one, Folks. I thought I had a tuna sandwich tonight, but it looks like I have hot sausage rolls instead! Flight Suit has five different hop varieties for a super citrus burst, and a generous helping of Mandarina Bavaria hops to give this beer a marmalade aroma and an extra orange flavour. I do love marmalade on toast, but I'm not sure I'll get flight clearance to recommend this for a breakfast beer! 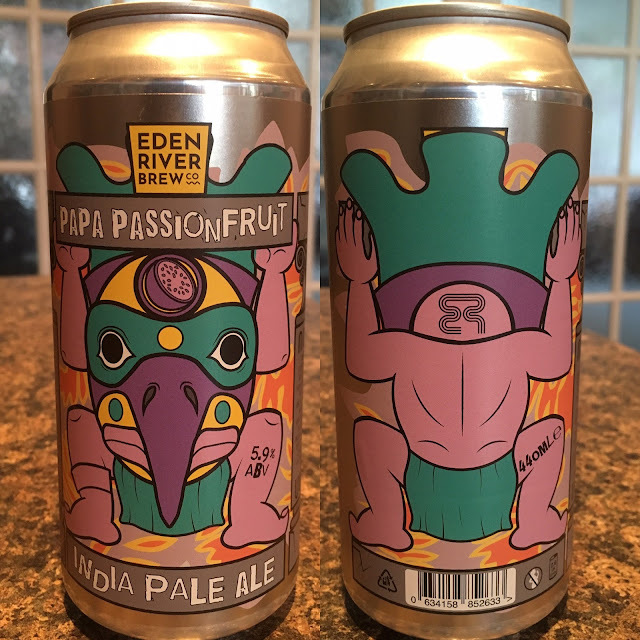 On opening the can this rather excitable 5.1% volume pale ale did smell reminiscent of marmalade, albeit a rather beery sweet barley and pale malt version of the breakfast spread. On taste this deep golden orange pale ale does taste orangy. Not the citrus blast I was expecting though. That bitter hoppy citrus often almost face twisting sharpness that can come with some orange pale ales. Flight Suit is pretty relaxing. It's more like Night Flight to Venus by Boney M. Yes, there's citrus bitterness on take off, but it didn't bother me in the slightest. I just sat back and waited for the flight attendant to pour the rest of my drink. The sweet malted barley came almost immediately soothing my tastebuds after the bitter citrus hops, and then the Mandarina Bavaria hops spaceship's thrusters fired, making me realise this is a beer to enjoy without food. And so the Mandarina Bavaria hops merged into the aftertaste with the sweet pale malt spiriting my palate to some far off orange planet allowing me to spacewalk in my Flight Suit with fantastic orange pale ale on tap. McVitie’s have brought out quite a few biscuits in their handy grab bad format, but the latest ones are a bit different. 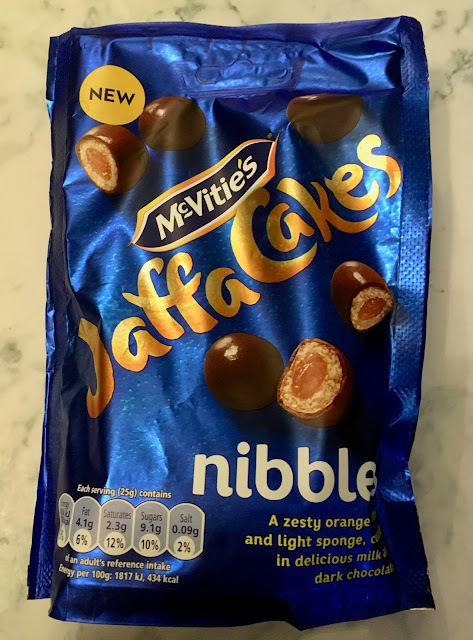 They have chosen to merge one of Britain’s iconic biscuits (well technically cake, but that is a whole different blog post) with their new format and have produced these new McVitie’s Jaffa Cakes Nibbles. 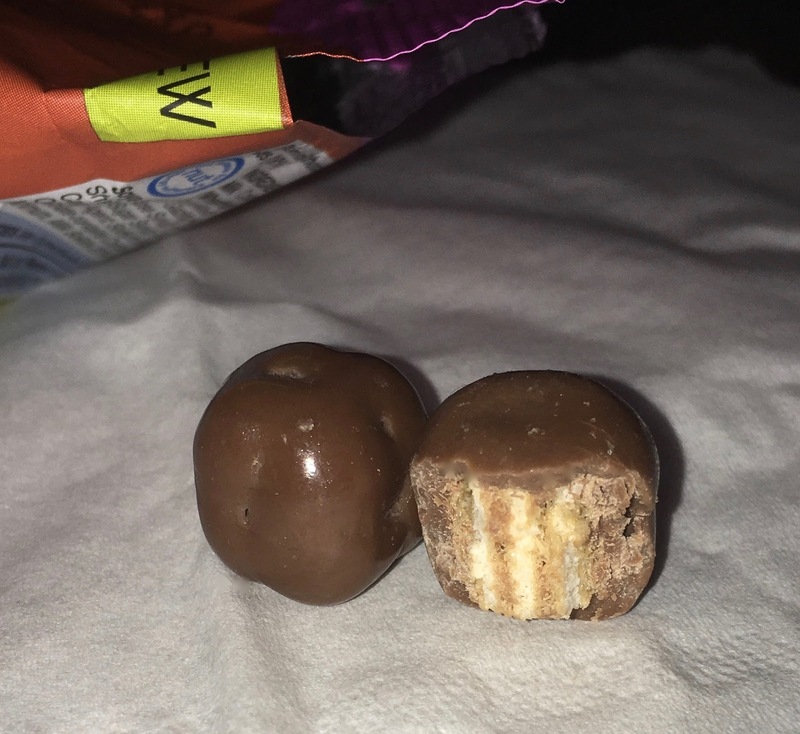 I have to admit before opening the bag I had made two incorrect assumptions about the product, firstly was that the size of the Nibbles would be the same size as others in the range ie small, and secondly that in order to encase the orange centre the biscuit would need to be hard. In actually fact the McVitie’s Jaffa Cakes Nibbles are a bigger than the others, I’m guessing around double the size, and a a more flatter shape too and they managed to use a firm sponge to keep the theming correct. The flavour is surprisingly moreish, chocolate and orange does just work. There is a higher chocolate ratio here in this format, and it means you can really appreciate the darker flavour from the cocoa. 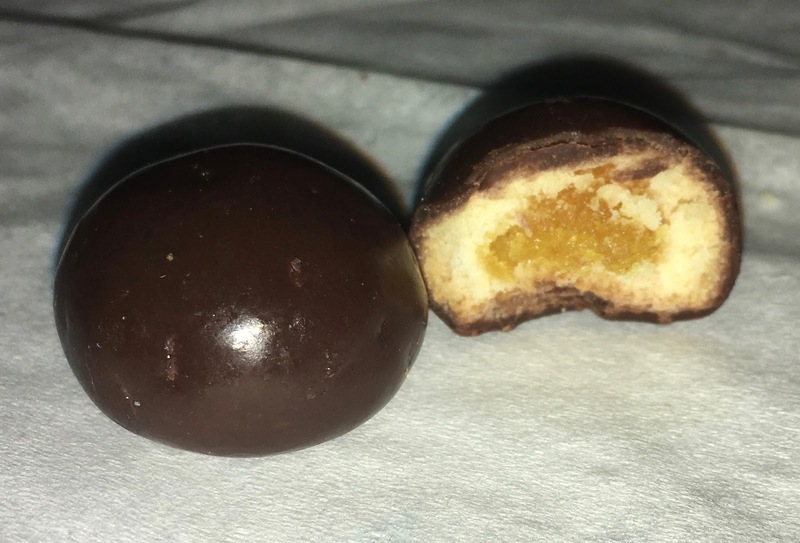 The texture works well, the softness made them very easy to eat, and the little burst of Jaffa jam was perfect delivering a lovely hit of orange. These are my favourite item in the McVitie’s Nibbles range to date and they have totally done the conversion to this format justice. Pure munchy sweet chocolate orange heaven. The first of these is this fairly simple chicken & leek pie. 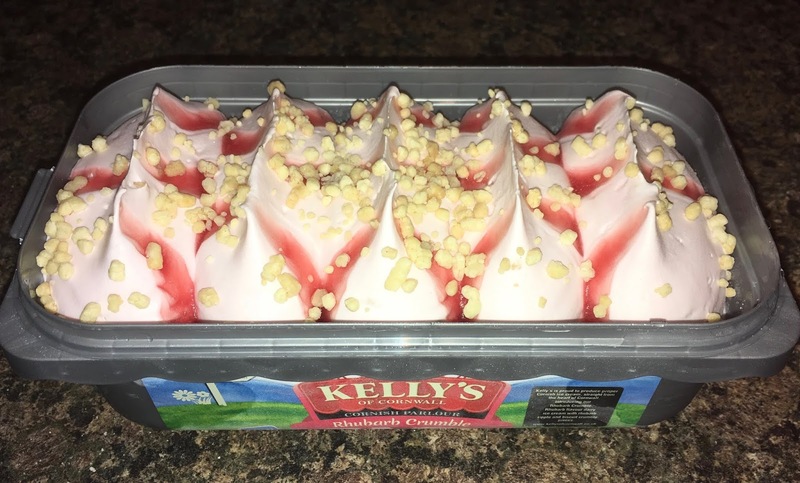 My partner claims that she didn't deliberately buy one with a big heart on the top for valentines day. She may not of consciously noticed, there is a big window on the box though so clearly her brain did. I accept my loving gesture on Valentines week and look forwards to further spontaneous romantic things. The big heart pie forms part of a lovely nutritious meal too - with those crispy potato things I always forget to buy. And the insides are as expected - huge chunks of meat that actually require cutting up! Recognisable leek and tasty ham. I'd happily have these again as a variation on my typical Pie Minister, and I'm now intrigued about the possibilities of me taking these to work and eating them cold! 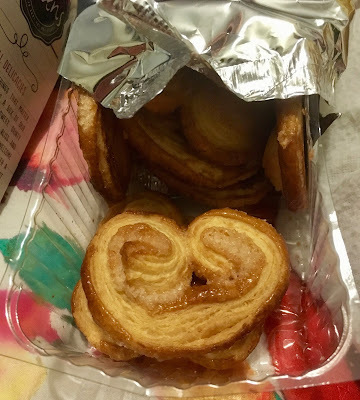 So, white hot chocolate ready… On opening the box there was a multitude of caramel sugar glazed heart shaped Petites. They looked a little like Danish pastries. Baked to perfection and slightly crunchy, I just had to eat the first couple just to see what they tasted like. I attempted to dunk one into my hot chocolate and noted how the drink stuck to the outside of the biscuits. These biscuits are made of tough stuff and don't melt on dunking into an ultra hot drink (or possibly even a blast furnace). The white chocolate and the caramel coated biscuits made for a sugary taste sensation. They tasted very sweet and sugary, and not for the faint hearted. 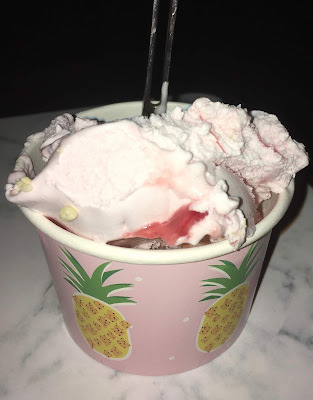 I have to admit, it was a little too sweet for me, but it made for a glorious pick-me-up after all the daily exercises I have to do to rehabilitate my poorly newly operated on knee! 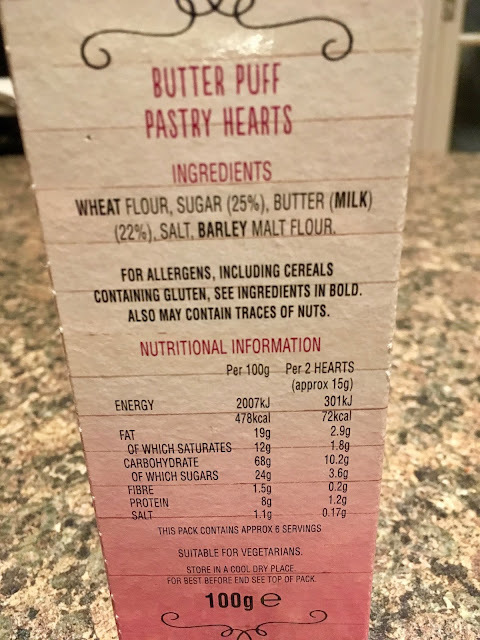 The 100g box contains 72 calories for every two hearts (which are approximately 15g), with 2.9g of fat, 3.6g of sugar, and 0.17g of salt. Ingredients included; wheat flour, sugar (25%), butter (milk), (22%), salt, and barley malt flavour.